Gold Velvet Corner Sofa Bed • Our Charlotte Range has a beautiful scrolled arms and refined design. • Charlotte sofa comes with high back cushions as shown on the picture. • Built in the UK on a hardwood frame with foam-filled seats with foam top providing great comfort. • Upholstered in a plush velvet style which is a durable polyester fabric. • High quality materials used throughout. 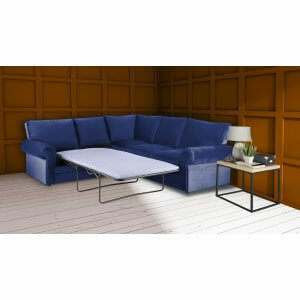 • Fold out solid metal frame sofa bed that is sprung and has a sleeping area of 183cm x 92cm. • Supplied with a 3” mattress that folds away inside. Perfect for occasional use with guests, a great sleep, without compromising the sofa. Turquoise / Teal Velvet Corner Sofa Bed • Our Charlotte Range has a beautiful scrolled arms and refined design. • Charlotte sofa comes with high back cushions as shown on the picture. • Built in the UK on a hardwood frame with foam-filled seats with foam top providing great comfort. • Upholstered in a plush velvet style which is a durable polyester fabric. • High quality materials used throughout. 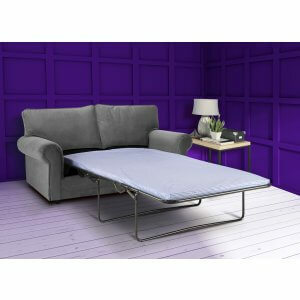 • Fold out solid metal frame sofa bed that is sprung and has a sleeping area of 183cm x 92cm. • Supplied with a 3” mattress that folds away inside. Perfect for occasional use with guests, a great sleep, without compromising the sofa. Grey Velvet Corner Sofa Bed • Our Charlotte Range has a beautiful scrolled arms and refined design. • Charlotte sofa comes with high back cushions as shown on the picture. • Built in the UK on a hardwood frame with foam-filled seats with foam top providing great comfort. • Upholstered in a plush velvet style which is a durable polyester fabric. • High quality materials used throughout. 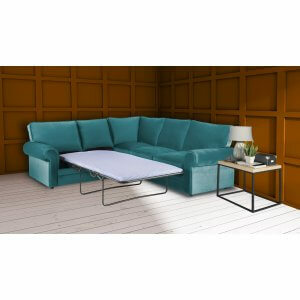 • Fold out solid metal frame sofa bed that is sprung and has a sleeping area of 183cm x 92cm. • Supplied with a 3” mattress that folds away inside. Perfect for occasional use with guests, a great sleep, without compromising the sofa. Blue Velvet Corner Sofa Bed • Our Charlotte Range has a beautiful scrolled arms and refined design. • Charlotte sofa comes with high back cushions as shown on the picture. • Built in the UK on a hardwood frame with foam-filled seats with foam top providing great comfort. • Upholstered in a plush velvet style which is a durable polyester fabric. • High quality materials used throughout. • Fold out solid metal frame sofa bed that is sprung and has a sleeping area of 183cm x 92cm. • Supplied with a 3” mattress that folds away inside. Perfect for occasional use with guests, a great sleep, without compromising the sofa. Gold Velvet 3 Seat Sofa Bed • Our Charlotte Range has a beautiful scrolled arms and refined design. • Charlotte sofa comes with high back cushions as shown on the picture. • Built in the UK on a hardwood frame with foam-filled seats with foam top providing great comfort. • Upholstered in a plush velvet style which is a durable polyester fabric. • High quality materials used throughout. • Fold out solid metal frame sofa bed that is sprung and has a sleeping area of 183cm x 122cm. • Supplied with a 3” mattress that folds away inside. Perfect for occasional use with guests, a great sleep, without compromising the sofa. Blue Velvet 3 Seat Sofa Bed • Our Charlotte Range has a beautiful scrolled arms and refined design. • Charlotte sofa comes with high back cushions as shown on the picture. • Built in the UK on a hardwood frame with foam-filled seats with foam top providing great comfort. • Upholstered in a plush velvet style which is a durable polyester fabric • High quality materials used throughout • Fold out solid metal frame sofa bed that is sprung and has a sleeping area of 183cm x 122cm. • Supplied with a 3” mattress that folds away inside. Perfect for occasional use with guests, a great sleep, without compromising the sofa. Grey Velvet 3 Seat Sofa Bed • Our Charlotte Range has a beautiful scrolled arms and refined design. • Charlotte sofa comes with high back cushions as shown on the picture. • Built in the UK on a hardwood frame with foam-filled seats with foam top providing great comfort. • Upholstered in a plush velvet style which is a durable polyester fabric. • High quality materials used throughout. 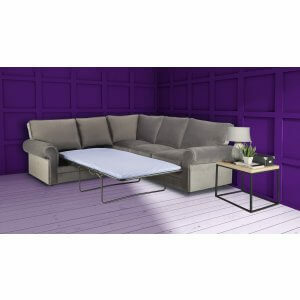 • Fold out solid metal frame sofa bed that is sprung and has a sleeping area of 183cm x 122cm. • Supplied with a 3” mattress that folds away inside. Perfect for occasional use with guests, a great sleep, without compromising the sofa. Turquoise / Teal Velvet 3 Seat Sofa Bed • Our Charlotte Range has a beautiful scrolled arms and refined design. • Charlotte sofa comes with high back cushions as shown on the picture. • Built in the UK on a hardwood frame with foam-filled seats with foam top providing great comfort. • Upholstered in a plush velvet style which is a durable polyester fabric. • High quality materials used throughout. 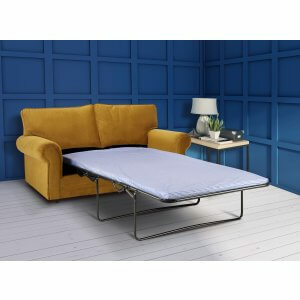 • Fold out solid metal frame sofa bed that is sprung and has a sleeping area of 183cm x 122cm. • Supplied with a 3” mattress that folds away inside. Perfect for occasional use with guests, a great sleep, without compromising the sofa. Sofa bed in crushed velvet •	Our Charlotte Range has a beautiful scrolled arms and refined design. •	Charlotte sofa comes with scatter cushions shown on the picture. •	Built in the UK on a hardwood frame with foam-filled seats with foam top providing great comfort. •	Upholstered in a crushed velvet effect and is a hard-wearing polyester fabric. •	High quality materials guarantee quality • Fold out solid metal frame sofa bed that is sprung and has a sleeping area of 183cm x 122cm. • Supplied with a 3” mattress that folds away inside. Perfect for occasional use with guests, a great sleep, without compromising the sofa. Silver Crushed Velvet 3 Seat Sofa Bed •	Our Charlotte Range has a beautiful scrolled arms and refined design. •	Charlotte sofa comes with scatter cushions shown on the picture. •	Built in the UK on a hardwood frame with foam-filled seats with foam top providing great comfort. •	Upholstered in a crushed velvet effect and is a hard-wearing polyester fabric. •	High quality materials guarantee quality • Fold out solid metal frame sofa bed that is sprung and has a sleeping area of 183cm x 122cm. • Supplied with a 3” mattress that folds away inside. Perfect for occasional use with guests, a great sleep, without compromising the sofa. Mink Crushed Velvet 3 Seat Sofa Bed •	Our Charlotte Range has a beautiful scrolled arms and refined design. •	Charlotte sofa comes with scatter cushions shown on the picture. •	Built in the UK on a hardwood frame with foam-filled seats with foam top providing great comfort. •	Upholstered in a crushed velvet effect and is a hard-wearing polyester fabric. •	High quality materials guarantee quality • Fold out solid metal frame sofa bed that is sprung and has a sleeping area of 183cm x 122cm. • Supplied with a 3” mattress that folds away inside. Perfect for occasional use with guests, a great sleep, without compromising the sofa. Black Crushed Velvet 3 Seat Sofa Bed •	Our Charlotte Range has a beautiful scrolled arms and refined design. •	Charlotte sofa comes with scatter cushions shown on the picture. •	Built in the UK on a hardwood frame with foam-filled seats with foam top providing great comfort. •	Upholstered in a crushed velvet effect and is a hard-wearing polyester fabric. •	High quality materials guarantee quality • Fold out solid metal frame sofa bed that is sprung and has a sleeping area of 183cm x 122cm. • Supplied with a 3” mattress that folds away inside. Perfect for occasional use with guests, a great sleep, without compromising the sofa.